Rabbi Singer’s Groundbreaking Two-volume Book Answers Christian Charges Against Judaism! I was recently asked how the newly released, Expanded Edition of the two-volume book, Let’s Get Biblical!, differs from an earlier, single volume Study Guide that bears a strikingly similar name. These works are vastly different in both scope and substance. After the popular, single volume study guide was published back in 2009, I immediately set out to produce an exhaustive new, encyclopedic work that would cogently and clearly respond to numerous serious charges vigorously launched by Christian missionaries against the Jewish faith. It was imperative that no allegation against Judaism was left unanswered. Until recently, the material that I teach was accessible only to the scholarly elite. I was determined to make these cherished principles comprehensible to anyone who craves to understand why Judaism thoroughly rejects the doctrines of its younger rival, Christianity. What emerged from this rigorous endeavor more than a half a decade later is the new, groundbreaking two-volume book, Let’s Get Biblical!. This new innovative two-volume series surveys the ancient world and answer a pressing question: How did a small, fledgling group of early Christians transform itself into a worldwide religion that stretched across the Roman Empire and beyond? As it turned out, if the earliest Church was not pliable, and did not quickly adapt itself to the ancient Greco-Roman world that enveloped it, Christianity would have joined the ranks of many other Jewish sectarian movements, and vanished without a trace. Why, how, and when did the Church adopt the enduring creeds such as the belief in Jesus’ virgin birth, the rejection of the Oral Law, and the Doctrine of the Trinity? Why did Christian translators deliberately tamper and aggressively alter the Jewish Scriptures? What compelled the church fathers—indeed virtually all of Christendom—to divorce itself from the Jewish crucible from which it emerged? This pioneering work decisively delves into this conundrum, and clearly answers these pressing questions by tracing the Christian Church from its inauspicious beginnings among the few followers of Jesus in Jerusalem to the heart of the empire, the city of Rome. Originally, I assigned a different title to this two-volume work. 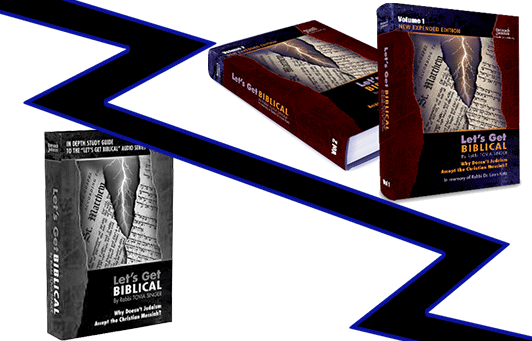 Recently, however, I looked back at the earlier Study Guide and realized that my readers would benefit from an exhaustive commentary on the material that made the Let’s Get Biblical! series so popular. I then added a lucid and comprehensive annotation in my new works. Accordingly, I retained the title of my earlier book. In essence, the new, two-volume books are an entirely new work in both scope and content. The new Let’s Get Biblical!, Volume 1 & 2, makes no attempt to reconcile the Synagogue and the Church. Quite the contrary, this work was written in direct response to the growing cry from both Jews and gentiles who crave to understand the reason─the real reason─why Judaism does not accept the Christian messiah. This expansive new tome─the product of years of meticulous research─answers this timeless question. This looks like it woiuld be good read to all. Together we found documentation that both my parents were born a Jew. My fathers family were the largest family to migrate to NY. My mothers family came from Canada. This is fact. Tovia, Thank you for the work you are doing, and have been doing all these years dedicating yourself to exposing the fraudulent teachings of the “messianic” Christians and their attempts to deceive our Torah, our people, and our religion. Bless you and your work for many years to come. Thank you Ha shim, Blessed be He, for allowing me to become aware of Rabbi Singers work. It is, in my opinion, the best for teaching us who are Noahides. Thank you Rabbi. Thank you for writing the books and for the work that you do. I sincerely appreciate you and the good work you do. Seeing this today has renewed my hope and motivation to remain true to what I believe to be truth. I’m totally confused. 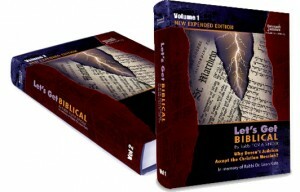 How do I order just the 2 volume set of Let’s Get Biblical without CD’s or study guide? And what does this cost? You can choose either hardcover or softcover. Pricing is on that page. Can We and Should We Order The Original Old First Let’s Get Biblical Book? I don’t recommend purchasing the older version of the book. The new two-part series is filled is far more information.